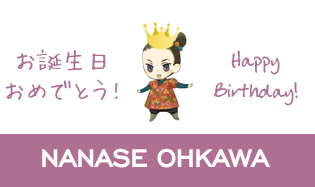 Today is the birthday of CLAMP member Nanase Ohkawa (my favorite CLAMP member ♥)! She’s turning 44 today. Unfortunately, Nekoi didn’t draw anything for her this year… I wonder what’s keeping her so busy… Hope all is well. Today is also the release of GATE #3 and RG Veda #3, from CLAMP CLASSIC COLLECTION (check the cover here). But Nekoi did post on Ohkawa’s birthday – I can’t access private boards, but I see that newest post from Nekoi board is from 05-02 and it’s titled Omedetou gozaimasu~, so I guess that’s it? Yes she did, but it’s a text-only message 😉 she even apologized for not making a drawing this year.